Go to the highest point! The specialized art of jumping, tumbling, and balancing, requiring agility and skilful control of the body. The word derives from the Greek akrobatos, which may be translated ‘walking on tiptoe’, but which literally means ‘to go to the highest point! The performing art of acrobatics has roots in ancient Chinese culture, where it emerged in tribal rituals related to daily activities. Acrobatic gymnastics (previously called sport acrobatics) is a competitive gymnastic discipline where partnerships of gymnasts work together and perform figures consisting of acrobatic moves, dance and tumbling, set to music. There are three types of routines; a 'balance' routine where the focus is on strength, poise and flexibility; a 'dynamic' routine which includes throws, somersaults and catches, and (at FIG level 6 and above) a 'combined' routine which includes elements from both balance and dynamic. 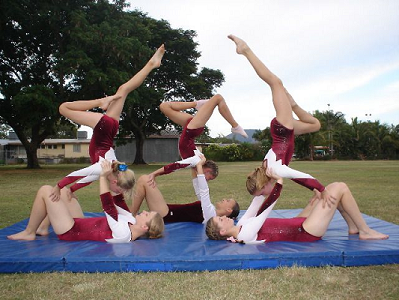 The sport is governed by the International Federation of Gymnastics (FIG). At international level, there are four FIG categories of competition defined by age; 11-16, 12-18, 13-19, and 15+ (Senior). Will increase your strength and flexibility.